We’ve been doing Bill Dance Outdoors fishing shows for almost 40 years and have promoted LOTS and LOTS of different products. But, I have never seen so much hype and never received so many phone calls, letters, emails and faxes over one little product that we started using back in 2008. It’s an inexpensive little tool that’s handier than a pocket on a shirt and will remove a single or treble fishhook from a fish’s mouth quicker than a minnow can jump a dipper! Another great thing about it …it helps me from getting hooked! It’s called an Advantage N501 Hook Remover and for all of you having trouble finding it, Bass Pro Shops tells us they are available now and advertised in the Father’s Day Sale flyer that runs through July 5. When we created this blog, our intentions were to bring you up to date information on what was happening at Bill Dance Outdoors and Bill Dance Saltwater and some of the crazy things we experience from day to day. NOT to promote products, but since we’ve been overwhelmed with inquiries, we thought this would be the most expedient way to get the information out to you! Now, for a little up-to-date info on what’s happening in our camp. Just got back from an exciting shark shoot with my good friend, Captain Tony Murphy in Key West. Catchin ‘em on artificial was a hoot and actually seeing them hit it created more excitement than I could stand. 100 – 200 pound shark thirty feet behind your boat, smashing a crankbait in 2 – 3 feet of water is a sight to behold! After leaving there, spent a day with my little buddy, Captain John Callion in Marathon and caught my biggest tarpon, … 160 pounder! Another great show for 2010 for The Outdoor Channel. Moving north the next day, got to spend a great day with Captain Andy Thompson doing one of the neatest and hardest things I’ve ever done, catching bonefish in Key Biscayne. What an adventure! Got back home in time for Dianne to do my laundry, get packed again and headed south to the gulf where we shot a show titled “Cast Light for Fun Fights” and what an appropriate title. It was done with 7 foot medium action rods and 20 sized Cabo reels, spooled with 8# Original Stren that had an 18″ fluorocarbon leader and tied to that, a _ ounce Bomber Flair Jig. 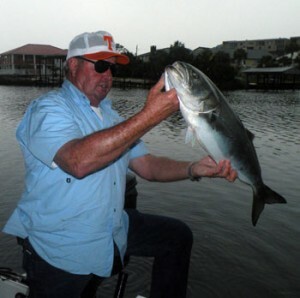 Here we caught numerous bluefish ranging from 4 – 16 pounds. Once hooked it was like hooking into a runaway dump truck. Each one reminded me of a 20 pound smallmouth on steroids! Hope you’ll get to watch um and enjoy um as much as I did!